28 members were present at our Christmas meeting plus our speaker, Tony Trent. Unfortunately Malcolm Newman was not able to be with us due to flu but we were very pleased to see Norman Williams (back after cancer treatment) and Hugh Roberts. A short silence was held for our Companion Member, Bevan Taylor who died age 98, 8th November and we remebered ArthurTrunchion’s wife, June, who passed away a week ago. Almoner, Andrew Kellard, reported that Derek Bass (eyesight), Brian Blakeney (now uses a walker) and Norman Pollard (sent a letter hanging up his probean boots – his and his wife’s health) are now not able to come to meetings. Absentwere Roger Davis (fall), Lionel Downton, Peter Mills (recovering), Tony Simpson (housebound), and Arthur Truncheon. 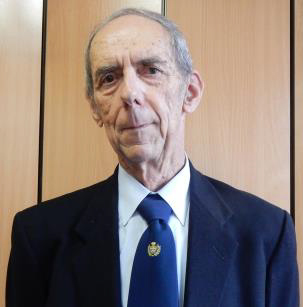 If you, your partner or another member is unwell please contact our almoner, Andrew Kellard on 01737 554055. Also temporarily for lunches – please notify Andrew by 10.30 am the prior Tuesday. The Charity Collection raised £56.40 and the raffle £34 which will be donated to Malcolm Newman’s charity, St. Christopher’s Hopice. Chairman, Ian Payne summed up the achievements of our 50th AnniversaryYear (see editorial in December’s Newsletter). The last event was the Quiz on2nd November which raised £306 for the Chairman’s charity, ‘Old Coulsdon Cenre for the Retired’. Officers gave their reports – correspondence included a letter from Eugene Lightbody’s daughter thanking us for his eulogy in theNewsletter . . . speaking of which, a few articles are lined up but more are needed. Following the Chairman’s request for next year’s committee, we are pleased toannounce that we have volunteers for the following positions: Chairman, Vice Chairman, Secretary, Treasurer, Almoner, Speaker Sec, Outings Sec,Membership Sec and Website. What’s still missing is a Luncheon Secretary to take over from Andrew Kellard who has very kindly kept this vital function running. Please consider this post if only for one year. Tony had been a radio operator in the Merchant Navy in the days when Morse code (as used by Marconi in the first international message) was essential for communication. Tony thought we needed some practice in case war were to destroy the satellites which had made his job redundant. So having provided copies of the Morse code for each table, he proceeded to test us on first a short four letter code and then a long message. Despite repeats, no one was able to decipher it. And so we went with Tony on his 1974 trip around the world. He was surprised to find that he had a personal steward assigned to him. They went to New Zealand via the Panama Canal. The French first tried to build it with a straight cut at sea level – 22,000 died in the effort. Then the Americans took over and raised the ships in a series of locks up to the central Gatun Lake and down again – picture of ships on the way up. The first ship through was in 1914. The Americans ceded the Canal Zone to Panama in December 1999. Eleven days across the Pacific to South Korea then to Hong Kong. There were ships in the harbour and junk boats. Families who lived on the boats made a living by ferrying goods from ships to shore. We saw views of shipsthen 1950’s trams, shops, market, station and cable car and an aerial view from the hills above. Singapore had ships in harbour and the famous statue of a lion installed by Prime Minister Lee Kuan Yew in 1972. Next Penang in Malaysia then the Philippines comprised of thousands of islands – pictures of loading at the docks, huge factories and pineapples. Tony swapped soap for hooch. Back to Europe with pictures of ships, mostly Russian, in Hamburg harbour then the Forth Bridge in Edinburgh. Questions: cargo carried? – Every conceivable type; chorister? – After the Merchant Navy, Tony had been a chorister working with the Royal School of Church Music – hence the erroneous billing of his talk as ‘Chorister at Sea’. I trust that you all had a joyous and merry Christmas. Yours truly spent Christmas day with family and put on three pounds. It was a super day – no cooking (for Pauline) and no clearing up and no disposal of wrapping paper from the countless presents heaped on everyone and especially the children from family and friends. Comeuppance came two days later when we woke up to no power and no heat. We insure the gas and the water but not the electrics. I consider myself a competent electrician – after all it’s only a matter of joining the brown to the brown and the blue to the blue (red and black before 2004 but we’rechanging back after B*****). The master switch on the box was off and flicked off again on each attempt to switch it on. Switching each circuit breaker off and trying the master switch established the trouble was the downstairs sockets (of which there are twelve). Switch the sockets off one by one and try again – except that it failed each time.Oh, the trouble’s in the wiring. We’re on a hill and the downstairs wiring is theoretically accessible from the cellar except that you can’t move for storageand the wiring is higgledy-piggledy and hidden by under-floor insulation. Had an animal entered the cellar from the garden and chewed a bit of cable? So, remove the breaker box cover and disconnect the wires to the appropriatebreaker. “What do I do if you’re electrocuted?” The fault is not in the breaker,so reconnect one end of the power circuit (no joy) and then open up each socket in turn and disconnect – the piano had to be moved revealing . . . and a dead frog. The fifth socket did the trick so reconnect both ends in the breaker then move on to the sixth socket which happens to be in my workshop behind and below the house. Finally the problem was isolated to the spur on the other side of the workshop. The wiring looked fine, so what about the socket box itself? One dead spider and a network of gunge trickling from terminal to terminal. Clean up, check all the box connections, close all the boxes and put backthe piano. A full day’s work and today I’m aching all over – I’m not used tocrouching, lying on floors, jumping up and down – but think what I saved! It is the “Queens Highway” and if her servants choose to put yellow no parking signs on it resistance is futile. I have 24 hours to vacate a stretch of road outside my own house or my car is forfeit. Further info is on the council website. I haven’t time for that as a refuge is needed before others get the spaces down the road. Lucky I was there when the notices arrived. I have been run out of my territory. The occupying forces arrive early in the morning scattering road closure signs and after digging a six foot deep by twelve feet wide and forty foot long excavation they make themselves at home together with two mobile toilets, seven large cable drums and a caterpillar excavator (bright yellow). We are well and truly “occupied”. Mywife’s car is still in our front drive and as a gesture of good will we can drive it onto a small stretch of road (by means of a three point turn) from which all other traffic is excluded! As with any occupation the “occupied” feel disenfranchised and even apprehensive, what will happen next? Well before the invaders go home for the night they mark and encase their newly won land in a huge wire cage. Night falls. No traffic passes, silence reigns. Actually this is quite nice – we have been turned into a private road albeit with the aid of trenches. Some people benefitted from the Romans in Britain. A quote from The Life of Brian (remember the python team), comes to mind “Whatdid the Romans ever do for us?” Well perhaps we could rub along after all. Have you ever wondered if you would have been a collaborator? Well already there is a resistance movement so things are hotting up! Just before midnight they strike back. Two white van men move the road closing barriers and drive through leaving only a blind single lane ready for a head on crash! Fortunately there is no accident and the“Romans” are back to restore order before the rush hour results in head to head conflict. Better barriers are brought up and some of us are surreptitiously told we may move them if we replace them on leaving. Romans can be reasonable! Peaceful nights pass and we begin to feel a new sense of privilege. Drivers no longer test their tyres at our junction in an attempt to beat the traffic, it is all getting rather civilised. The resistance don’t quite see it that way and find that by half moving a heavy barrier and half driving on the pavement they can force a passage. It is dangerous. Is it time to inform the “management”? I make a phone call to the local Centurion outlining the risks (they take my name)! Within twenty minutes the barriers are re-instated by an unmarked white van! Efficient these Romans, could teach the local woad wearers a thing or two. AND IT DOESN’T END THERE! At dusk a silver van arrives, parks beside the cage. A uniformed guard gets out and affixes large stickers on the doors and bonnet reading DOG UNIT. Surely there is no dog, it must be a bluff. I must find out so when it is just not quite dark I casually stroll past the back of the van which is really a hatch back. I do not wish to upset the guard particularly if this is a bluff. So my glance is furtive. There is a cage containing a very large soulful looking hound that might well have lived on the Grimpen Mire, but it is as quiet as the grave. Don’t mess with Romans or they will definitely do something to someone. Many people admire firm governance and perhaps they have a point. For many weeks our guard is with us whenever there is no work going on and every night. He is a mild mannered person and is given water for his dog by our neighbours. Conversation is difficult because his English is limited, but we adopt him! By now the resistance are boiling. As I drive down the last few yards of my “private road” I am followed by a large car with two men in it. As I manoeuvre in to my drive they edge past me to the barrier, get out and start work on moving it. Our brave mild mannered guard gets in front of their car and states that they can’t pass without permission and they simply don’t have it. It really looks ugly as they will not accept his instruction to back up. Threats are made. I wish our boy had taken his dog to the boarder point and not left it in the van. However he stands his ground and even makes the very large men re-instate the barrier before they retreat. Calmness in the face of danger, these Romans are professionals and use economy of force. I ask him if he is O.K. and he is totally at ease assuring me that all is well. A few weeks later the resistance use paperwork and politics and within an afternoon the site is cleared and resurfaced. Our guard is withdrawn and the traffic is back! They rejoice in their victory but what only we know is that the electrical connections deep underground which they were re-engineering are not actually connected due to the speed of retreat. The Romans will be back before winter or all the lights will go out and the Turkeys will not be cooked because the old power lines will give way under pressure as they did once before.